You skimmed the online menus of marijuana products available at the state’s first two recreational stores — New England Treatment Access (NETA) in Northampton and Cultivate in Leicester — and you’re eager to find out what all the hype is about, now that it’s offered in a legalized and safe way. Check out this breakdown of some of the products offered at these two adult-use shops. These are prepared marijuana joints. They are best described as cigarettes stuffed with cured marijuana that has been finely ground, and only require a lighter to consume, making these perfect for novices. “I think it is a fine way to get started,” said Dr. Jordan Tishler, founder and CEO of InhaleMD, a medical marijuana consulting office in Cambridge. For those who want to smoke the whole flower in a healthy way, he recommends using a vaporizer that specializes in cooking the plants low and slow, preferably at 350 degrees Fahrenheit. NETA offers pre-rolls in two sizes. “Mini Pre Rolls” sell for $5 and contain 0.5 gram of marijuana. Depending on which strain, the amount of THC varies from 85 mg to 110 mg per pre roll. “Regular Pre Rolls” sell for $15 a piece and are twice as big as the smaller version. The amount of THC per pre-roll ranges from 90 mg to 120 mg.
At Cultivate, the pre-rolls range from $10 to $15, and have anywhere from 4 to 20 percent THC, depending on the strain. “[Concentrate] is a generic term that means we have taken the goodies out of the plant material, and here’s a batch of the medicine in a lump,” Dr. Tishler said. “That lump can range in purity and consistency,” and said beginners should be wary of trying concentrates. Most concentrates are used with a dabbing rig, a type of water pipe, or bong, with a special container for the concentrates. Using a torch, the attachment is heated to a high temperature, and a small scoop of the concentrate is dabbed onto the heated attachment. Once the concentrate meets the container, the smoke can be inhaled through the bong. The issue with dabbing concentrates, Dr. Tishler said, is dose control. This concentrate is the least purified of all the concentrates. It has a soft, clay-like texture, and can be used for dabbing or mixed in with ground bud for use in a joint, traditional bong, or a pipe. NETA sells its waxes for $50 a gram. The amount of THC per gram ranges from 740 to 880 mg, depending on the strain. At Cultivate, the waxes go for $60 a gram, and each gram carries anywhere from 650 to 810 mg of THC. 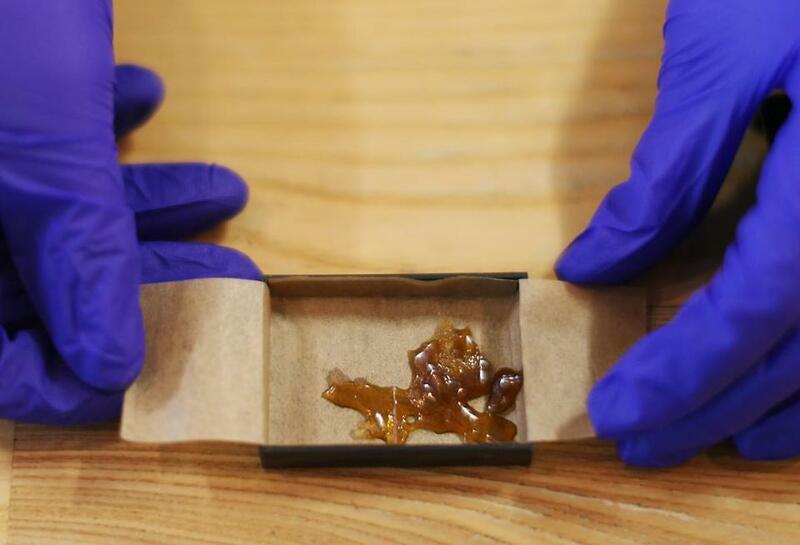 Shatter (right) has had the “impurities” of the wax removed, and has a hard, glassy texture that can “shatter.” It is consumed with a dabbing bong or with a vaporizer pen made for heating up concentrates. At NETA, shatter sells for $60 a gram, and each gram has 740 to 880 mg of THC. This is a purest form of cannabis and can be used in dabbing bongs, vaporizer pens, or to make edibles. Distillate is derived from heating and separating the compounds in the plant, which allows manufacturers to extract compounds. Distillate is more potent than the previously mentioned concentrates. Peanut Butter Oatmeal Cookie edibles at Cultivate. He said the amount of time it takes for the cannabis you ingest to affect you varies by product, person, and even then, it varies by the day. “If you take a dose and say, ‘geez, nothing is happening,’ and take another bit, there is a likelihood the first dose is going to catch up with you. My advice is go do something else. Go to bed, and then try it again the next evening,” he said. 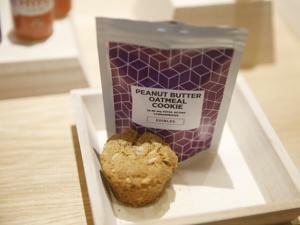 Cultivate offers a Peanut Butter Oatmeal Cookie (above), which contain 38 mg of THC and cost $15. Their Coconut Lime Macaroons are infused with almost 50 mg of THC and cost $25 each. The bulk of edibles offered at NETA are currently reserved for medical patients, but they do offer Dark Chocolate Bars ranging from 50 mg to 100 mg of THC, and are priced from $20 to $30. The same rules for edibles are applied here, except these contain less calories than, say, a brownie or cookie. NETA offers Gems, Chews, and Nuggets. One Gems pack costs $25 and comes with 16 units, each containing 5 mg of THC. The Chews offer 5 units with 5 mg of THC per chew, and cost $10. They also offer Nuggets, which are caramel chews conveniently parceled at 5 mg per square. Each Nugget brings 16 caramels, and costs $25. Because these products carry small doses, they can be great for beginners or those who have never tried an edible and are curious to see which dose they enjoy best. Cultivate offers ALTUS Beverages (left), which are “cannabis-infused shot drinks” offered in four flavors. One bottle costs $10 and has 25 mg of THC. Tinctures are a liquid applied under the tongue using a dropper. Whether or not the mixture is absorbed by veins in the mouth or in the gut is still up for debate, according to Dr. Tishler. At Cultivate, tincture bottles go for $60, and each bottle contains 115 to 248 mg of THC. At NETA, the Wishing Well tincture bottles cost $70 and contain 1 mg of THC per drop. Each bottle has about 480 drops.